By combining gravity and terrain mapping techniques, scientists from Australia have identified hundreds of previously uncharted craters on the Moon, including a handful on the far side. The researchers — Will Featherstone, Christian Hirt, and Michael Kuhn — used gravity and elevation data to develop the ultra-high resolution maps. Earlier, the same technology was used to map similar features on the Earth. Computer modelling allowed the team to remove regional features, thus revealing more detailed basins that would have otherwise been hidden using other techniques. Variations in gravity are an indication of rock density; if the gravity anomaly is large, there are denser rocks beneath, and vice-versa. 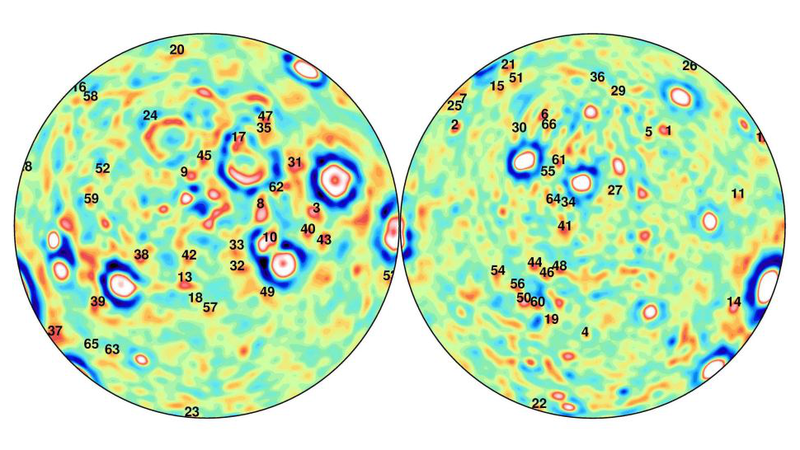 So, by plotting the gravity map, the researchers can literally look inside celestial objects, like moons and planets. And in fact, the team has already taken a glimpse at Mars in the same way. “Our curiosity-driven work initially focused on the identification of two basins on the lunar far side, but was extended during the peer-review process of scientific papers so as to cover the whole Moon,” Featherstone noted in a Curtin University press release. This research will soon be published in a future edition of the Journal of Geophysical Research — Planets.